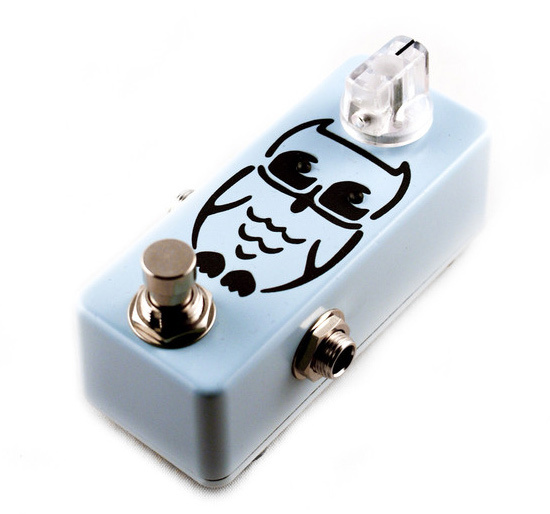 Today, I wanted to put out a reminder post for the Pedal Projects Owly Booster Give Away. If you’re running a tube amp, this is going to be a great addition to your board. Boosting your signal to overdrive those pre-amp tubes is a great thing. But, the pedal could also be used to drive pedals as well (so I don’t want to say that tube amp is required for goodness). I’m a huge fan of driving the preamp! First, let’s talk about Pedal Projects. They’re a great company out of Iceland making some awesome sounding/looking pedals. Attention to detail is high. Ásgeir is a pleasure to deal with. Among the Owly, he also makes the Growly, Klone, Marbleverb, Litli Fuzz, Bufferlo and also performs modification. One mod that is gaining popularity is a EM+Drive Mod. Definitely check out Pedal Projects for more information. I also did an an interview with Ásgeir a while back as well! Okay.. now back to the give away! You have until July 28th to get your entry in… and you can do that here. Also, if you could, please share, tweet, email anyone that might be interested! Spreading the word would greatly be appreciated! Pedal Projects Owly Booster Give Away Normandy Guitars O-CB Overdrive / Boost Give Away Reminder Lightning Boy Audio Soul Drive Give Away Pedal Python Give Away! Celestial Effects Capricorn Rock Distortion Give Away!